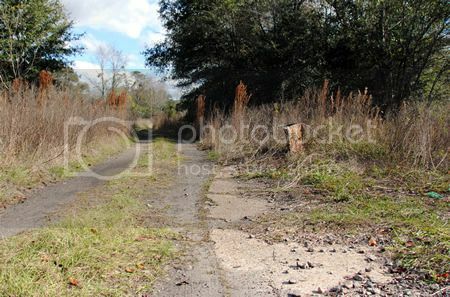 I have had an obsession with abandoned railroads for just about as long as I can remember. You may have noticed that even though this blog is fairly young, I’ve written about railroads a good bit already. As a child growing up in Columbia City, I used to be convinced that I could hear the ghostly echo of the train running between Lake City and Fort White, which used to run through Columbia City – even though those tracks had been pulled up before I was even born. 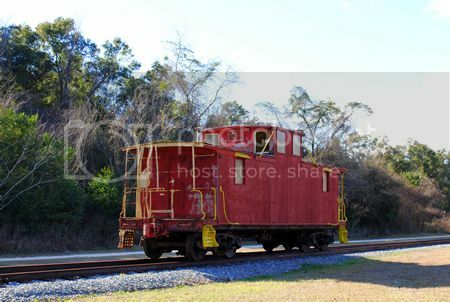 During Fort White’s boom years in the late 1800s to early 1900s, trains connected Fort White to Lake City and Live Oak to the north and northwest, and to High Springs and Gainesville to the south. 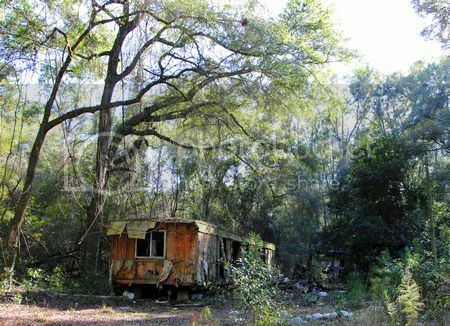 During that time, the population of the community swelled to roughly 2000, and was supported by the mining of phosphate, the collection of turpentine, and the growth of cotton and oranges. The trains bustled in and out of town, carting away the goods which funded the community. However, as with many booms, this one went bust. The phosphate mines depleted, extreme freezes killed off the orange orchards, and boll weevils destroyed the cotton. People moved away, the rail lines fell silent, and eventually the rails were removed. 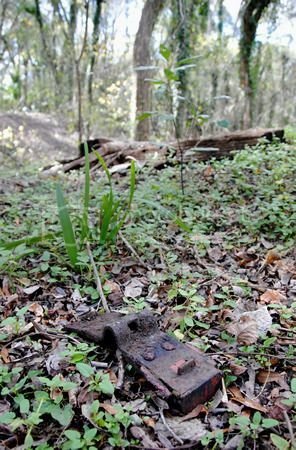 Parts of the rail line were converted to a rails-to-trails path, the O’Leno to Ichetucknee trail, although other sections remain overgrown and wild. The old Fort White train station has an interesting post-rail history. After the railway line became inactive, the physical train station was sold to a farmer in the nearby town of Branford, who moved it to his property and used it as a barn in which to store hay. A picture of the station in its hay-storing capacity can be seen here. 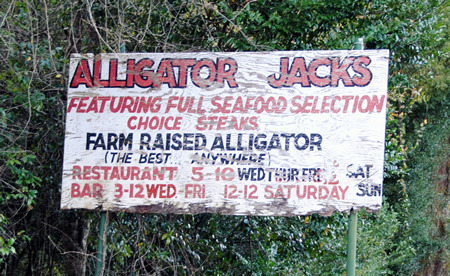 Twenty years later, in 2002, the farmer sold it back to the city of Fort White and it was returned to its original location. An image of the station after it had been returned to its original location but before its restoration can be seen here. It has since been refurbished, and is now used by the Fort White Chamber of Commerce. Additionally, a short stretch of track with a caboose (which had resided at the Kindergarten Center in Lake City for many years) have been installed. I like to browse real estate listings. 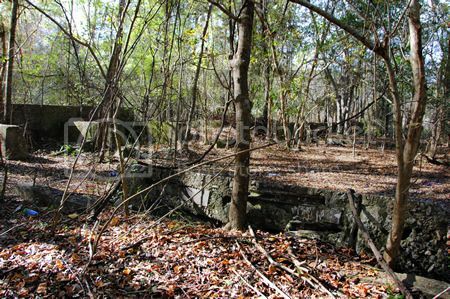 Last January, I discovered that roughly two acres of woodland bordering a stretch of the old Fort White to High Springs segment of abandoned railroad were for sale for an absurdly cheap price – slightly more than $3k. The catch? 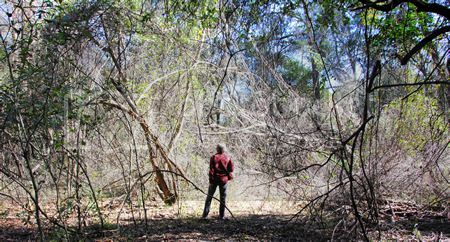 The property was landlocked, AKA inaccessible by car and without a minor bit of on-foot trespassing. Apparently at some point (during the housing boom, no doubt) someone had planned to subdivide the area, and had sold plots to various people, with plans drafted for access roads to reach said plots. 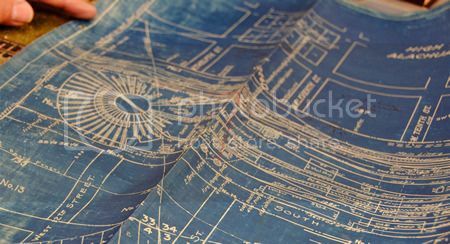 But as that boom, too, went bust, the area was never subdivided, and the planned roads to access the various properties were never built. 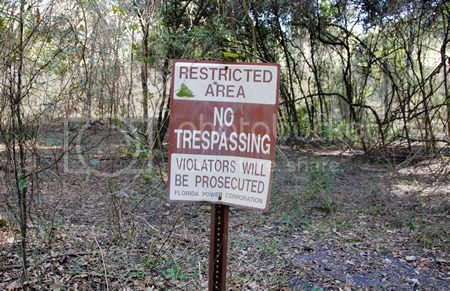 A bit of trespassing would be required any time anyone wished to access this land, which had been foreclosed on and was bank owned. 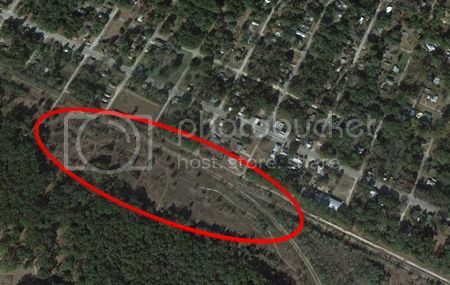 The property in question; the diagonal bit of land is the former railroad bed. I was convinced that if I made an absurdly low offer, the bank would accept. 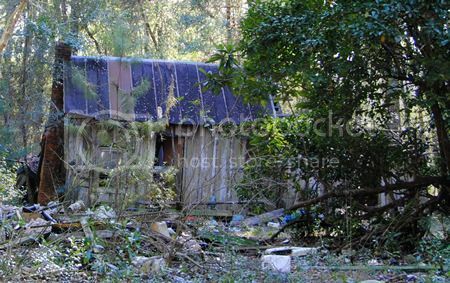 I mean, who else would want to own a piece of inaccessible woodland along an abandoned railroad? I convinced my mother and her boyfriend to accompany me to the property. 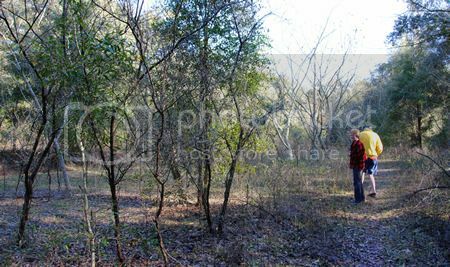 We had to park at the end of dirt road and walk through some woods of dubious ownership before reaching the abandoned railroad bed. We then had to trudge down the bed for a good ten minutes before we got to the actual lot in question. It was glorious overgrown woodland, and I imagined erecting a faux train station along the old line – and a million other fantastical ideas – before my mom talked me out of it. Alas. Don't mind us, we're just looking at real estate. 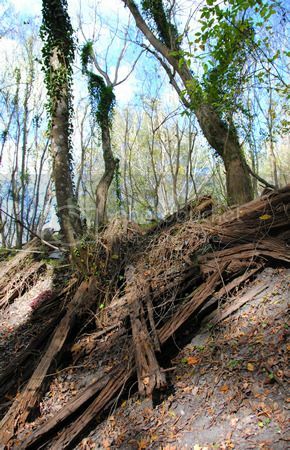 At some points the railroad bed was quite overgrown. Other parts were much easier to walk. Me, at the property in question. The property is no longer for sale; it was purchased last February by people who, alas, are not me. 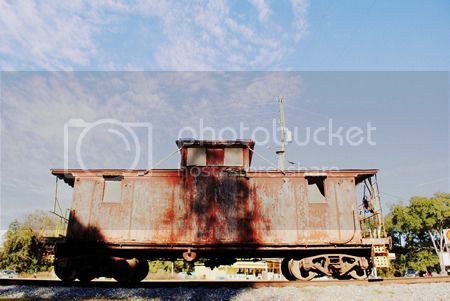 Perhaps its new owners, too, have bizarre fantasies of ghost trains. 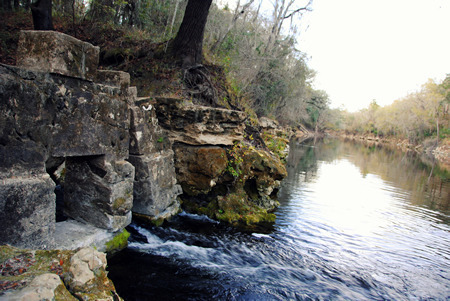 Roughly midway between Live Oak in Suwannee County and Lee in Madison County, Highway 90 crosses the Suwannee River, just south of the confluence of the Suwannee and Withlacoochee rivers. At this location – on the Madison County side of the rivers – a bustling community centered around a large timber mill once existed. 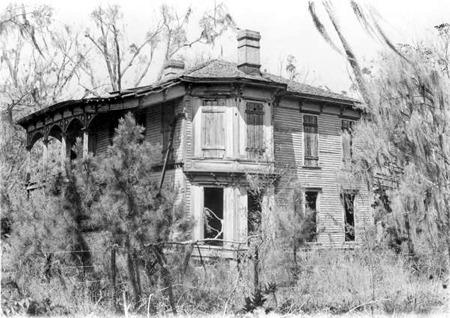 This community was founded in the late 1860s, when lumber magnate George F. Drew (who would later become the 12th governor of Florida) opened what was, at the time, the largest sawmill in the state of Florida. He named it Ellaville, and according to legend this was to honor Ella, his long-time African-American servant of that name. 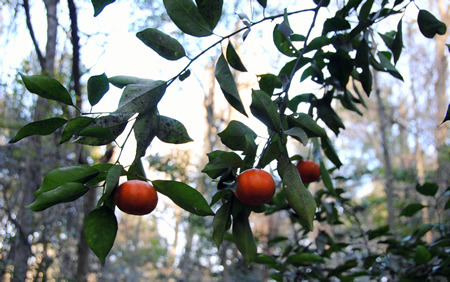 The area was covered in thick forests of yellow pine ready to be harvested, and the combination of the rivers and the fact that Ellaville was located along the railroad line connecting Jacksonville and Tallahassee, made it easy to transport lumber to market. The combination of the busy sawmill and the opulent residence of the state’s governor led Ellaville to grow and thrive. At one point, in addition to the sawmill and the governor’s mansion and the homes of the town’s several hundred residents, Ellaville boasted a post office, train station, two schools, churches, a cemetery, stores, a telegraph unit, and more. Additionally, the town’s location along the route of the Old Spanish Trail / Old Bellamy Road / modern Highway 90 ensured regular through-traffic, even in the horse-and-buggy days. 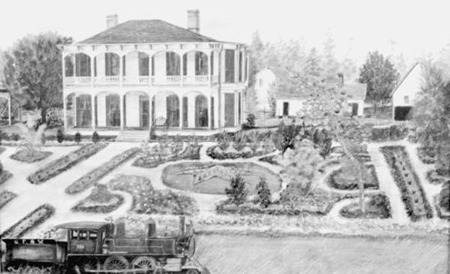 Painting of the Drew Mansion and gardens in its heyday in the late 1800s. 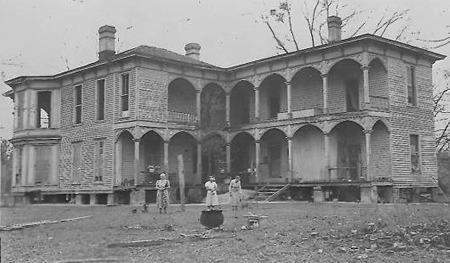 Drew Mansion in early stages of decay, 1932. 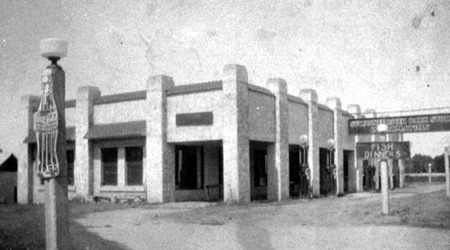 Suwannee River Store, built 1927, photographed in 1928 From here. However, while trees are a renewable resource, they were not planted and farmed in the late 1800s and early 1900s. Once the supply of trees fueling the mill diminished, the community of Ellaville did as well. This, combined with massive flooding, the Great Depression, and two successive world wars slowly killed off the community. In 1942, the Ellaville post office closed its doors for good, as there weren’t enough local residents to justify its presence. 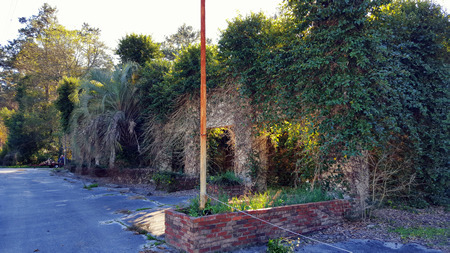 Two of the few remaining landmarks of Ellaville were the distinctive Suwannee River Store built in 1927, and the decaying remains of the long-abandoned Drew mansion. 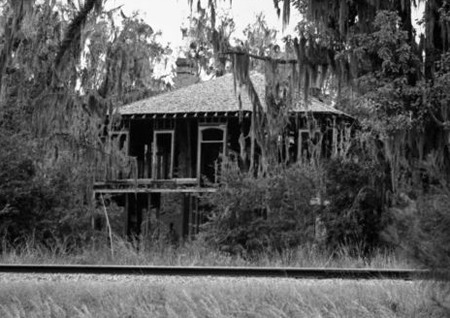 However, the Drew mansion succumbed to arson in 1970, and repeated flooding and the re-routing of Highway 90 across a more modern bridge to the west of Ellaville in 1986 led to the store being abandoned as well. 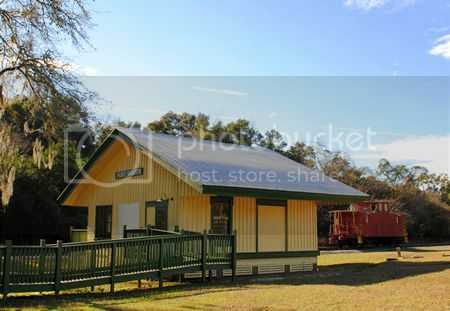 Today, the modern “community” of Ellaville is located just to the south of the Suwannee River, in Suwannee County. There you will find one convenience store, and a law enforcement weigh-station. 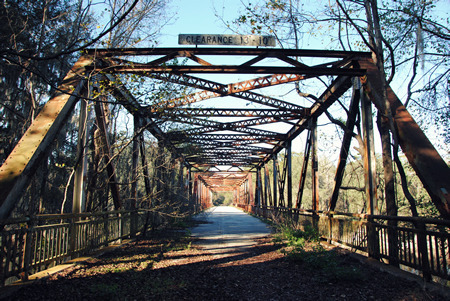 You can park and access the old Hillman bridge from the Suwannee county side or the Madison county side, although there is a parking lot with picnic tables on the Madison side. 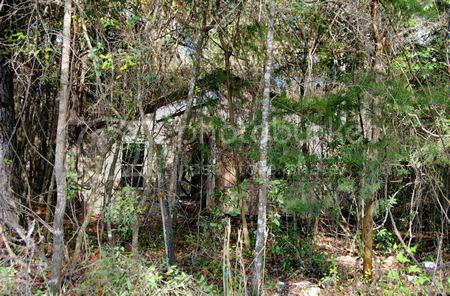 Of the once bustling town of Ellaville on the Madison side of the river, there is little sign, other than the parking lot, some historical markers, the overgrown remains of the Suwannee River Store, and two private residences. 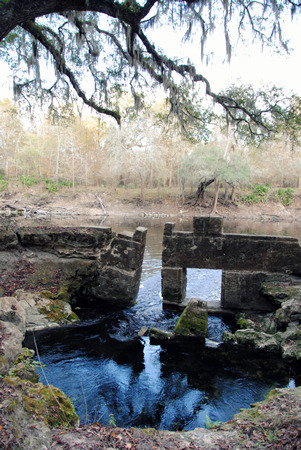 This is the entrance to the Hillman Bridge from the Suwannee County side. The road is closed to cars, but open to pedestrians and cyclists. According to this site, the mill had a small 0-4-0 steam locomotive. 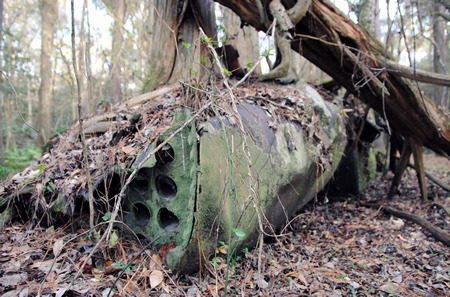 Could this be the remains of its boiler? The spring is a second magnitude spring, and it has a very heavy flow; you can hear the water rushing out of the spring house and towards the Withlacoochee before you can see the spring house itself. 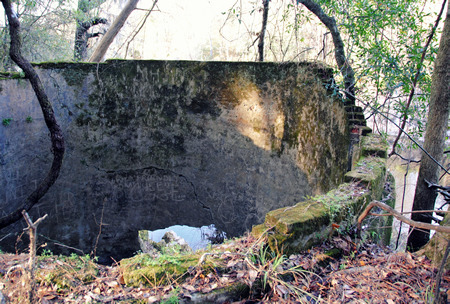 I have found very little information on the history of the spring house at Suwannacoochee, although it seems likely that it was connected to the mill facilities. Additionally, from what I've read, there's an Ellaville Spring there in addition to this one, although goodness knows where exactly. 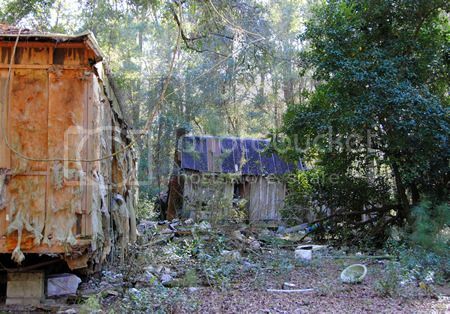 Probably hiding next to the remains of the Drew mansion and the Ellaville cemetery which we never did find. We do, however, plan to try again at some point. In the interim, if you're interested in the complete set of what we found at Ellaville, please CLICK HERE to see my complete photo set. 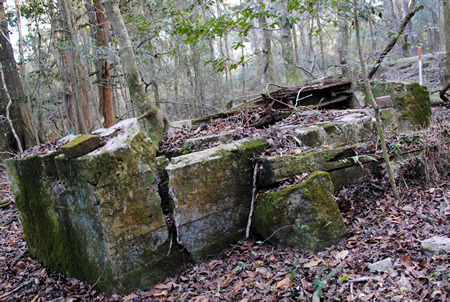 As you might notice, this is the third post about the abandoned railroad in High Springs, FL (the previous posts are here and here). 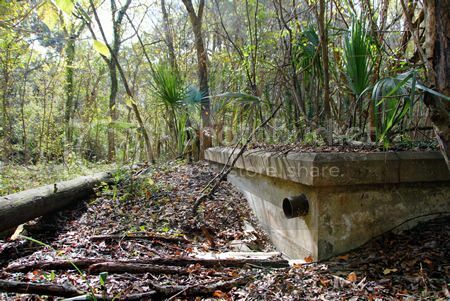 This is partly due to my obsession with old railroads in general, partly because I live in High Springs, and partly due to the fact that there’s just some fascinating stuff out there if you know where to look. 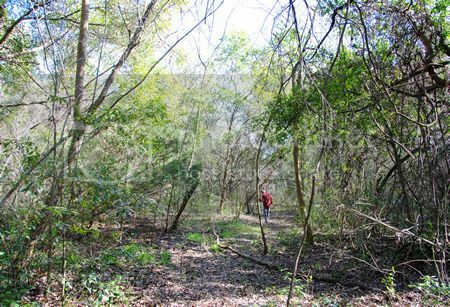 During our previous explorations of the rail line, we were mainly just following the different sections of old railroad bed, looking to see what we could find. 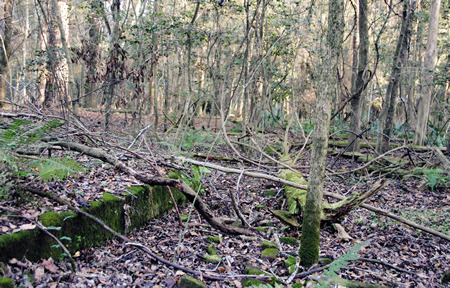 We knew that there had been a large railroad presence in High Springs at one point – complete with a roundhouse – but we didn’t know where any of the facilities had been located. It turns out that we had walked within a few feet of the remains of the roundhouse and other rail yard buildings without knowing it; it’s amazing what mother nature can hide. A couple of weeks ago we decided to check out the High Springs Historical Museum to see if they could tell us where the roundhouse had been located – and they knew exactly where it was (and where its remains still are). We, of course, immediately began planning to go and find it. But first I should probably give you a little background. I mean, first off, what’s a roundhouse? Wikipedia has a pretty informative article, complete with pictures of a variety of roundhouses, which should fill you in. Back in the days of steam locomotives, roundhouses were pretty common. They were a way to get multiple train engines off of a limited number of tracks and into garages for maintenance, involving a gigantic turntable with a piece of track on it. This article from American Builders Quarterly details how a roundhouse is constructed. 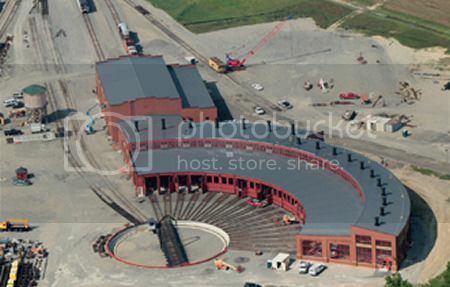 It’s also where I found the following picture, which gives you a good idea of how a roundhouse should look. The locomotive reaches the circle in which the tracks mounted on a turntable are located. The train rolls onto the turntable-mounted tracks, which are then rotated to line up with the tracks for the specific 'garage' into which the engine needs to go. Ingenious, really. High Springs of today is a quaint, laid back, small town. There’s little in terms of industry nowadays; the community’s big draws are nature-based tourism and antiquing. However, back in the 1890s during the heyday of steam powered rail, High Springs was a bustling center of railroad industry. 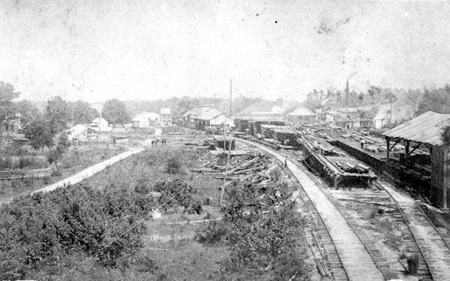 In 1895, High Springs became home to the division headquarters of the Plant System Railroad Line. By 1896, a roundhouse and a maintenance shop for steam locomotives had been erected – as well as a hospital, homes for railroad workers, and the various trappings of city life in the late 1800s. The population of the community swelled as railroad lines were added and the locomotive maintenance facilities grew more and more active. The roundhouse was rebuilt and enlarged in 1928 to accommodate the demand. Then the diesel engine was invented. By the end of WWII, use of steam locomotives began to dwindle, and the need for rail yards designed specifically to service steam engines declined. 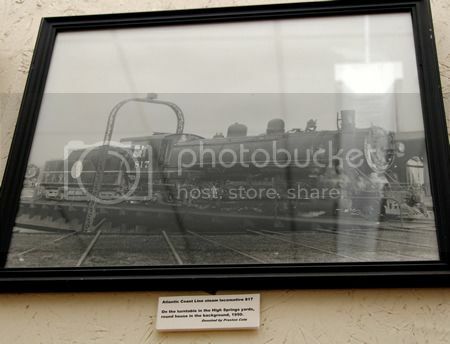 The High Springs Historical Museum has a photograph of the roundhouse in action in 1950, but it did not remain in use long thereafter. 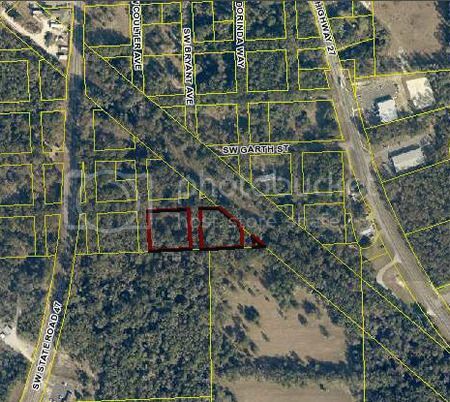 If you’re familiar with modern-day High Springs, you’ll know that the present day center of life in town is roughly two blocks of Main Street straddling Hwy 27, between 441 and the old railroad bed. 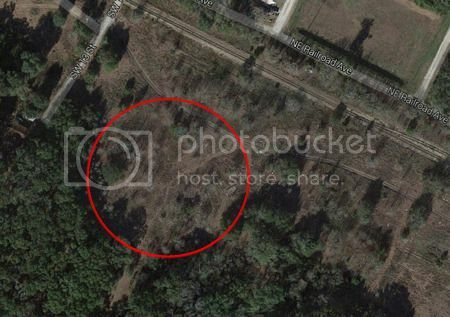 As this is the focal point of today’s High Springs, I had assumed that the rail yard would have been right there, too, or perhaps just a couple blocks to the north, where the peanut plant is located. It turns out that the massive rail yard was far too large to fit neatly next to downtown High Springs. 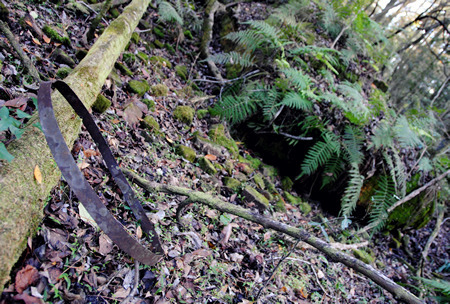 To find what remains of it, you actually have to head thirteen blocks northwest of Main Street. On the one hand, it’s surprising how little remains of what was once such an enormous and thriving enterprise. On the other hand, there are a lot of interesting remains of the facility if you know where to look. 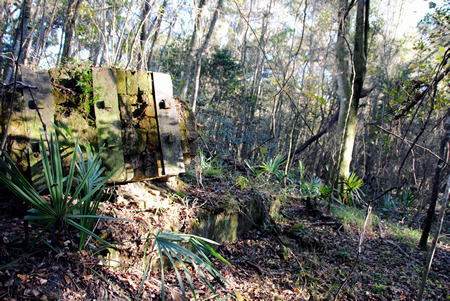 Just to the northwest of the former junction between the line connecting High Springs and Newberry with the line connecting Fort White to High Springs to Alachua is an area of undeveloped land which, while overgrown with brush, is not quite as overgrown as one might expect of rural north Florida. Instead of majestic old growth oak, one finds smatterings of spindly new-growth oak, surrounded by blackberry bushes and other prickly weeds. 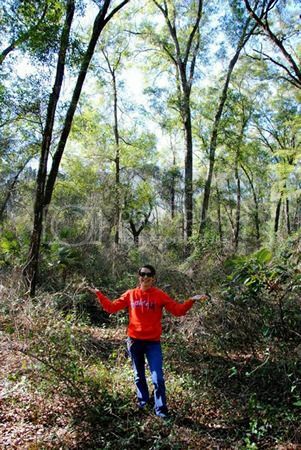 This empty, desolate stretch of land was once the economic heart of High Springs. The High Springs Historical Museum has a wonderful scale model of Old High Springs, including the rail yard - complete with roundhouse. ....which places it roughly there. 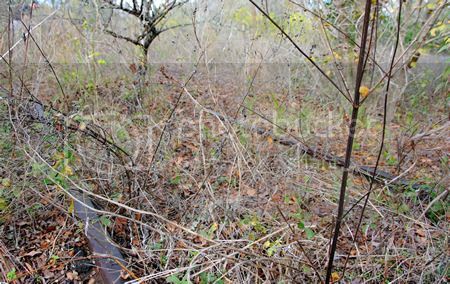 The remains of the rail yard are hidden under brush and brambles – as I mentioned above, we had previously walked within several feet of some of them without spotting a single thing – but if you pay close attention and know where to cast your gaze, you can still find the remains. Much of the yard was once paved in concrete, and quite a lot of it remains, although it's mostly covered by a thin layer of dirt and vegetation. Here you can see a tantalizingly curved section of concrete, perhaps marking the edge of the roundhouse. ...the rails of which are abruptly truncated. This makes a lot of sense if you think about the roundhouse structure. 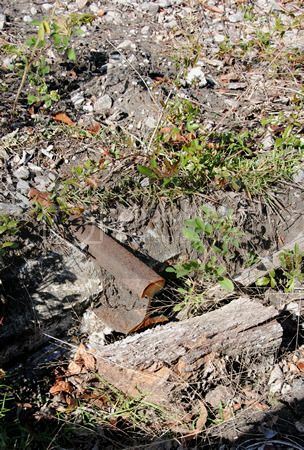 Railroad detritus is scattered throughout the area. I took so many photographs that I really can't post them all here. I did, however, upload the entire set to flickr, so if you're interested, you can check them out by CLICKING HERE. 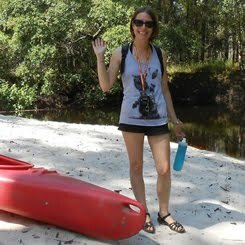 Last month I explored the Alachua County legs of the Old Bellamy Road. I wrote about that experience, as well as a little about the history of the road itself in Old Bellamy Road: Part 1. 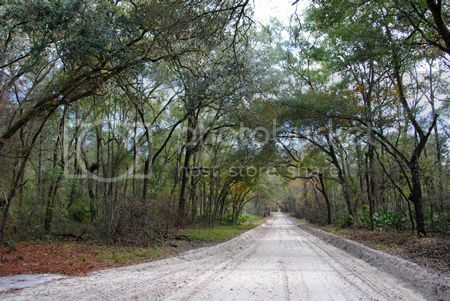 If you're interested in seeing pictures of the Alachua County segments of the road and/or if you'd like to learn a little about the history of this road, please check out Part 1. This past weekend, I decided to drive the Columbia County legs of the Old Bellamy Road. 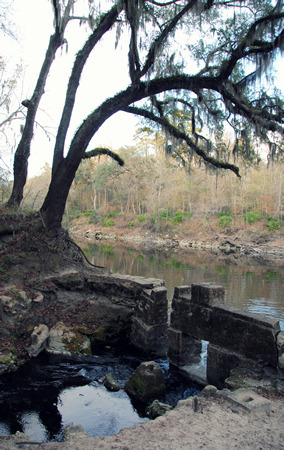 The westernmost segment of the Alachua County part of the Old Bellamy Road dead-ends into the O'Leno and River Rise State Park land, and the road picks up again in Columbia County on the western side of the park. 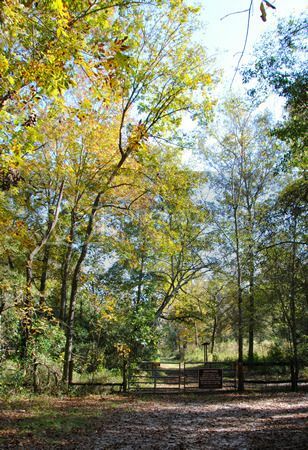 There is a small parking lot where the Old Bellamy Road enters the park on its western edge, and the part of the road which traverses the parkland is open to hikers, cyclists, and horseback riders. I have yet to hike the stretch of Old Bellamy Road which crosses O'Leno, but I definitely plan to do that in the future. I did, however, park in the small lot and take some photos. At the easternmost part of Old Bellamy Road before it enters O'Leno, looking west. The road through the park, open to hikers, cyclists, and those on horseback. From there I headed west as far as the remaining road would take me. 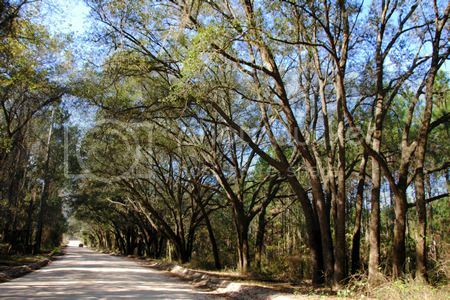 While it is a dirt road for its entire length in Columbia County, Columbia's Old Bellamy Road is much more traveled than its Alachua counterparts. 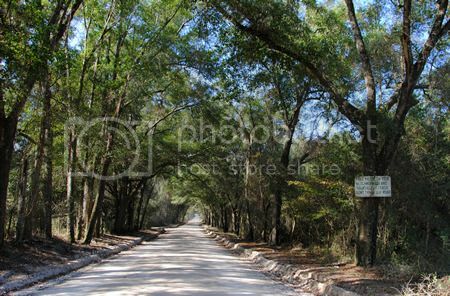 Additionally, while the road itself is quite scenic - mostly overhung with gorgeous old oaks - it was rather lacking in desolation or glimpses of Old Florida. The road is home to many of Columbia County's modern day residents, most of whom reside in modern houses, mainly in ranch-style houses and mobile homes. ...although in this case, old desolation lurked behind its modern compatriot. The sign on the tree reads, "Take pride in your neighborhood and yourself. Please don't trash our road." 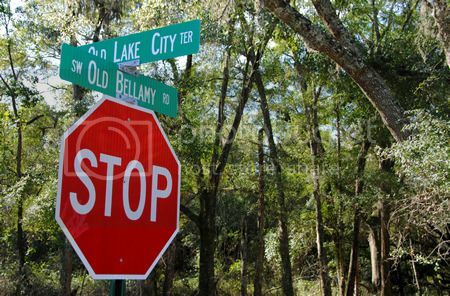 The Columbia County stretch of Old Bellamy Road dead-ends roughly five miles west of O'leno, just after crossing SW Old Niblack Ave. (Lake City folks: did you know there was an Old Niblack Ave in the southern part of the county? I always associated that name with the school north of town where I attended sixth grade. I'm curious now about the connection between the school and the road of the same name between Fort White and High Springs. Perhaps the family of Minnie J. Niblack, for whom the school was named, lived down there? Does anyone know?) As far as I am aware, there are no other segments of road in Columbia County bearing the name of Old Bellamy or Bellamy. However, from what I can tell, the original road and Old Wire Road followed much of the same path into Lake City. 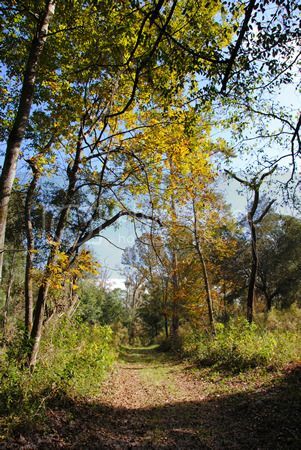 Additionally, the route that Hwy 90 takes from Lake City westward to Live Oak then northwest to what is now the Suwannee River State Park, and onward toward Tallahassee, seems to follow much of the track originally set out in the 1820s as the Bellamy Road.